Hmm, that's odd - that 1948 JCM 2 card of him shows him batting right handed when he was a left hander. An uncorrected error card perhaps? 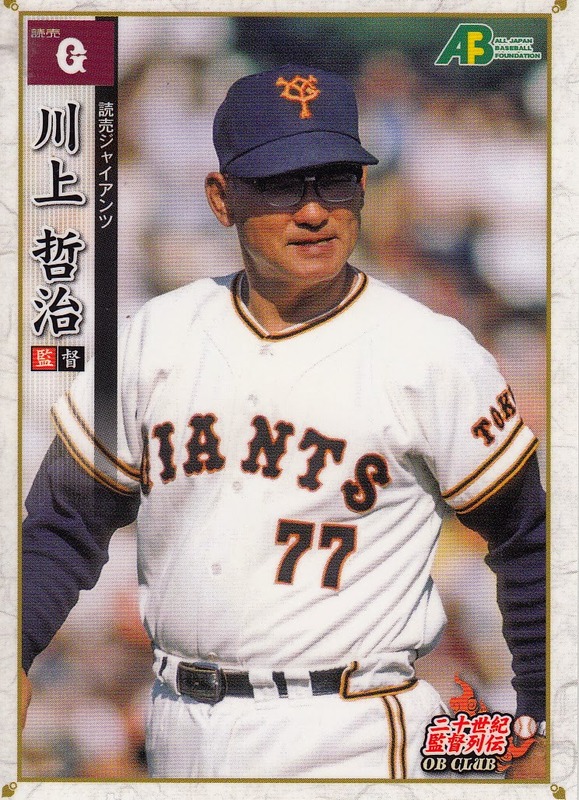 I found it interesting that both the Giants and the Eagles wore black ribbons on their uniforms in Game Four of the Nippon Series today in memory of Kawakami. 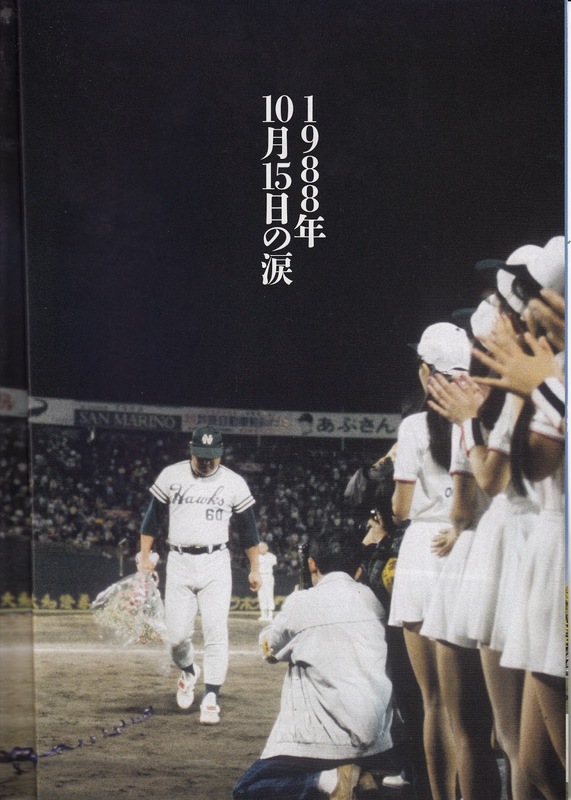 I'm a couple weeks late on this but October 15th was the 25th Anniversary of the final game ever of the Nankai Hawks. 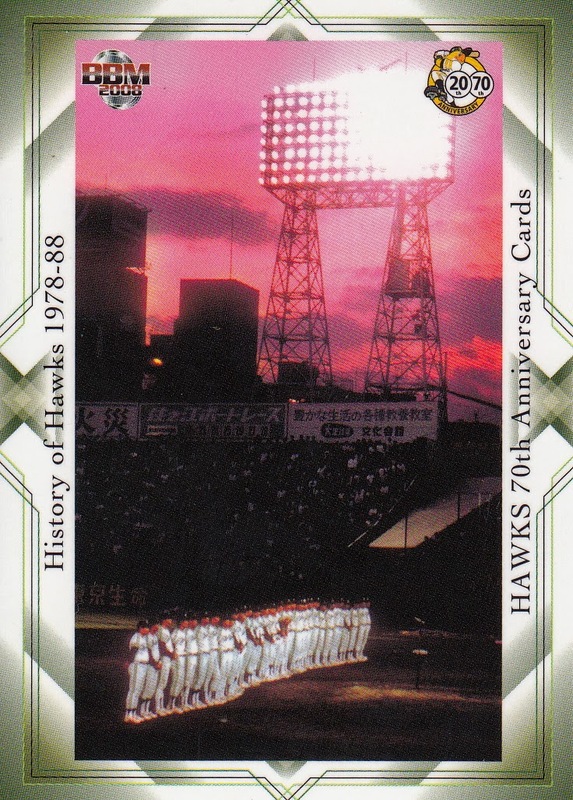 After 50 years of being owned by Nankai, the Hawks had been sold to Daiei and were moving from Osaka to Fukuoka. I've been doing a lot of snooping around on YouTube lately, doing searches based on Kanji text and finding a lot of interesting clips. One of the items I came across was a video of the closing ceremonies at Osaka Stadium that day. It was a very moving ceremony. After the team walked the team flag around the outfield, they all stood in a line from first to third across the infield. One by one, each player and coach was announced - when each person was announced, they would step forward, bow in each direction to the fans and then walk off the field. 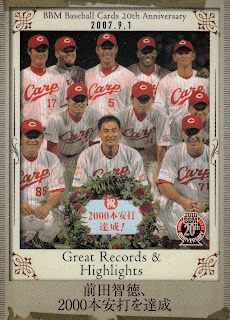 The roster was arranged in the typical Japanese style - coaches by number followed by pitchers by number, catchers by number, infielders by number and outfielders by number. 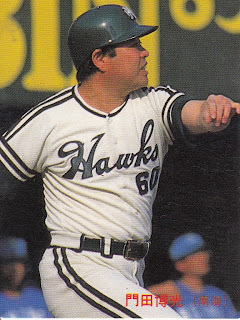 This meant that the Hawks biggest star at the time, Hiromitsu Kadota, an outfielder wearing uniform number 60, would be the last player on the field. Once Kadota left, the only person left on the field was manager Tadashi Sugiura, who had been a star pitcher for the Hawks in the late '50's and early '60's. I attended the Baltimore Orioles final game at Memorial Stadium in 1991 and you would not have found a dry eye in the place - and the Orioles were only moving downtown. As you would expect, the fans and some of the players were openly crying at this game, especially Kadota. He actually refused to go to Fukuoka with the team and remained in Osaka for the next two years with the Orix Braves. Just noticed an ad on BBM's website labelled "Cards Navi". Turns out that this is link to BBM's Facebook page which is called "BBM Cards Navi". It looks like they just launched it about 10 days ago. So far the posts look like the web pages for their new set announcements. And, of course, it's all in Japanese. 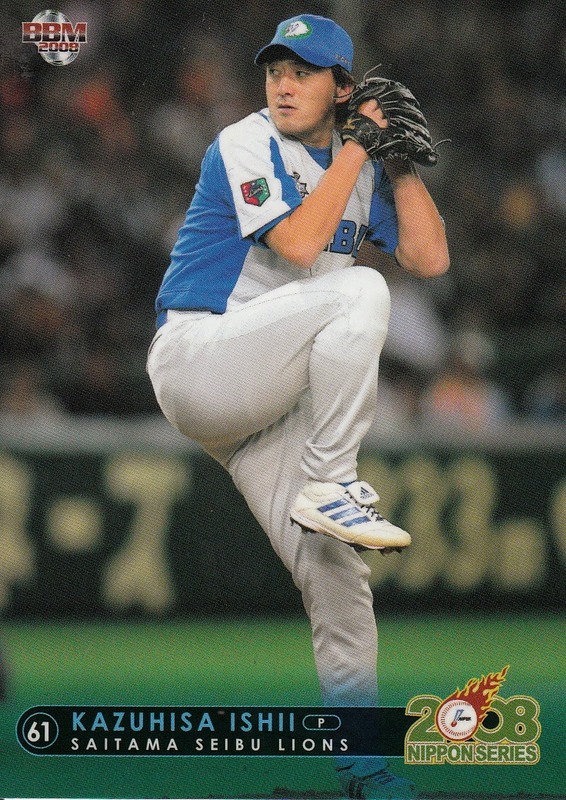 I saw some interesting Nippon Series trivia on Yakyu Baka regarding Takehiro Norimoto of the Eagles. Norimoto was only the third rookie pitcher ever to start Game One of the Nippon Series. 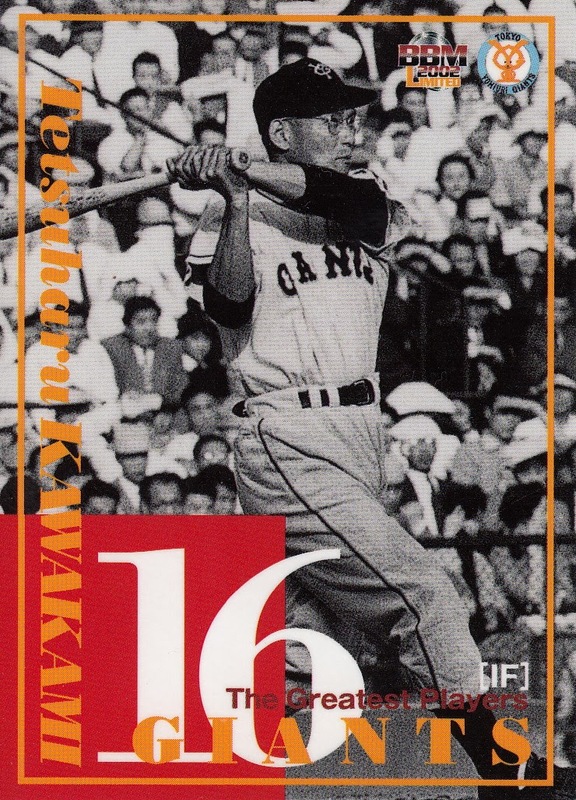 The first one was Nobuo Oshima, who started the very first Game One ever in 1950 for the Shochiku Robins. 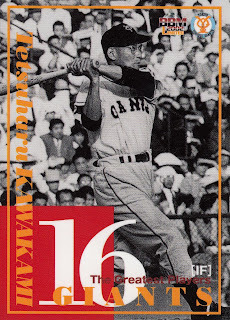 The second was Taketoshi Ogami for the Nankai Hawks in 1952. 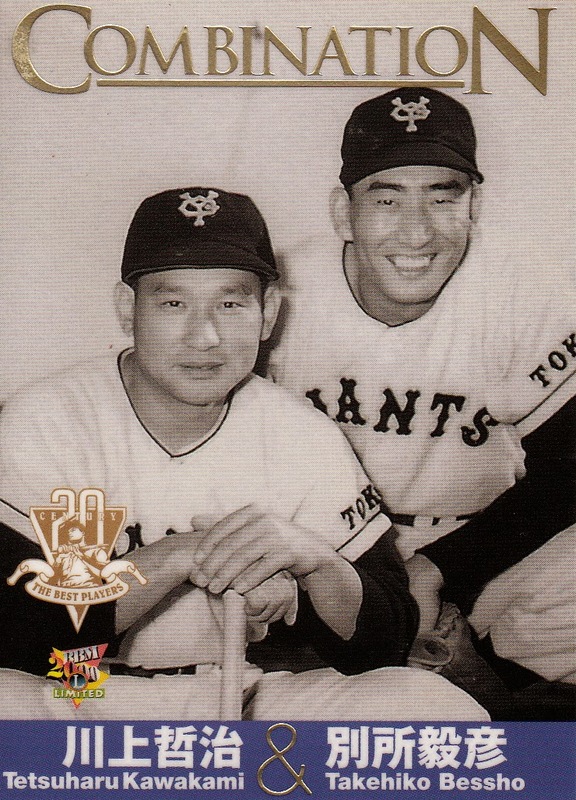 I thought it would be great to feature these guys this week but I don't have cards for either of them - both players' careers were rather short (Oshima was done after 1955 and Ogami was done after 1956) so neither have made any of BBM's OB sets. And I don't happen to have any vintage cards of either (I know Oshima had at least one bromide card - don't know about Ogami). 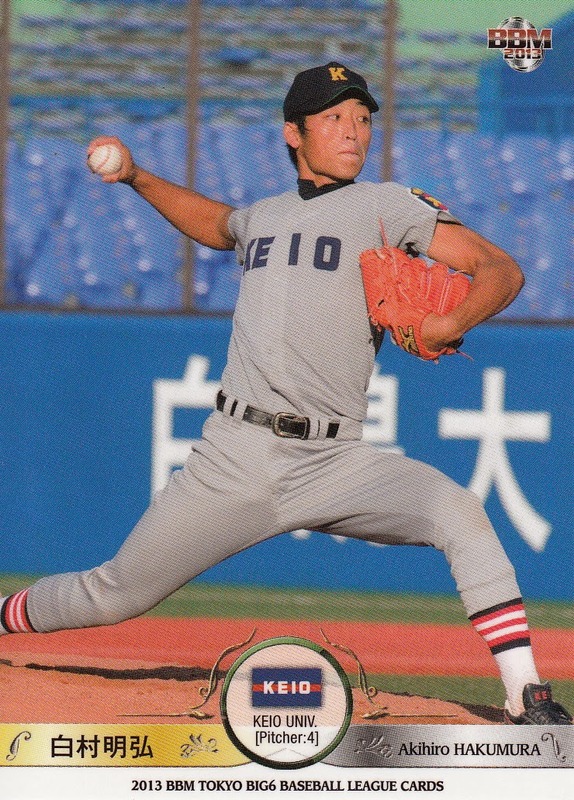 We won't have to wait six years for the next rookie pitcher to start a Nippon Series game - Tomoyuki Sugano is starting Game Two. Norimoto actually pitched quite well in Game One - going eight innings with ten strikeouts and only giving up two runs. Unfortunately the Eagles could not score any runs for him so he took the loss. But I would expect him to get another start later in the Series - assuming the Eagles manage to win a game or two. 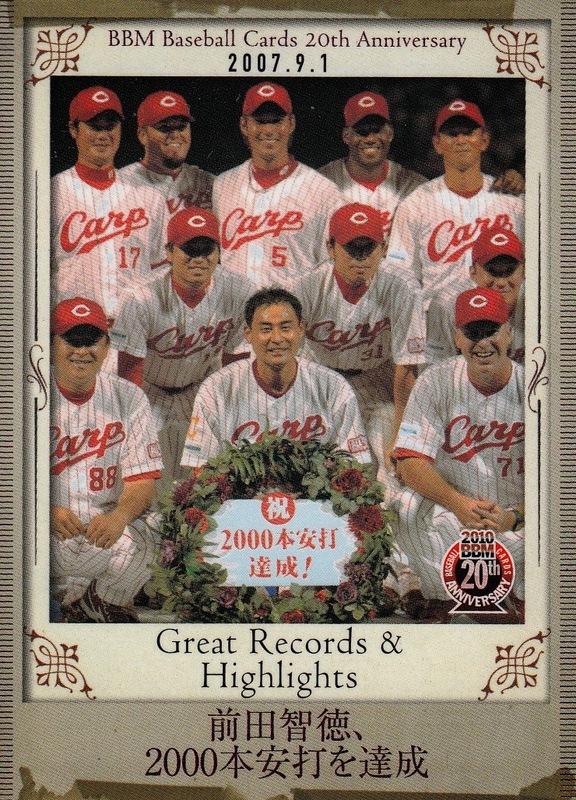 - First Crown is a box set commemorating the Eagles's first ever Pacific League championship (if I'm not mistaken, NPB treats the 1st place teams for each league as the League Champion, regardless of whether or not the team wins the Climax Series). The set will contain 27 base set cards for the Eagles players (and manager Senichi Hoshino I assume) and one "special" card - possibly an autograph, memorabila, foil autograph or photo card. The set will be out in late November. - I'm to assume that what BBM wants to call this next set is something like "Invincibility Legend" but Google translate is coming up with "Invincibility Myth" which doesn't sound as good. 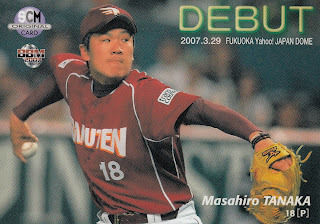 This is another 28 card box set dedicated to Masahiro Tanaka. 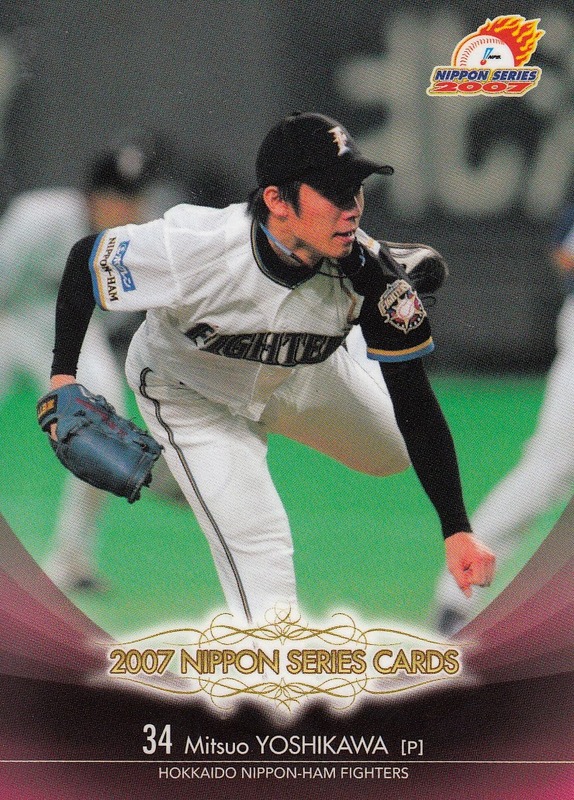 I think it's to celebrate Tanaka going 24-0 this year rather than a biography set for Tanaka (which BBM did for him back in 2010). 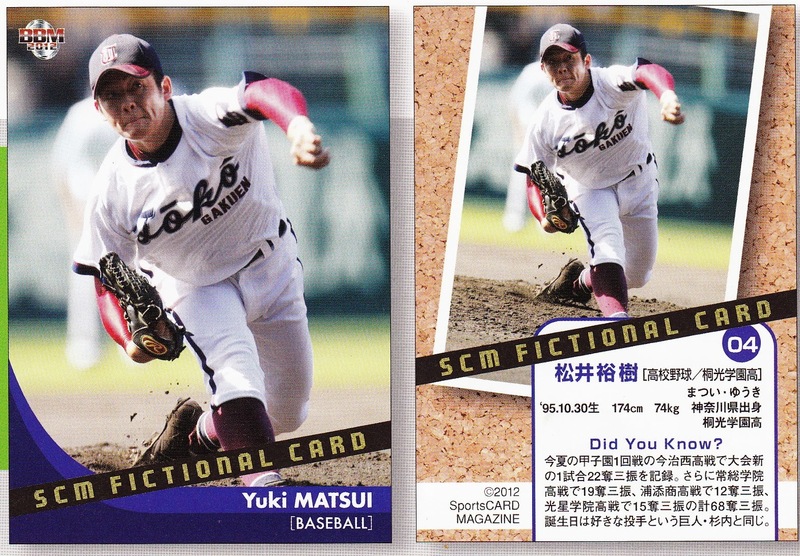 You've probably already guessed that the set contains 27 base set cards and one "special" card. 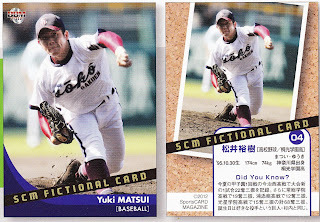 In addition to the usual autograph cards, it looks like the "special" card could also be a metallic card or a card with part of the pitching rubber from Miyagi Baseball Stadium. This set will also be released in late November. Weather permitting, tomorrow Miyagi Baseball Stadium in Sendai, home of the Tohoku Rakuten Golden Eagles, will host a Nippon Series game for the first time. This is not, however, the first time that the tenants of the ballpark will play in the Series. 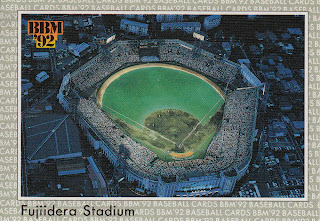 The Lotte Orions called Sendai home from 1973 to 1977. 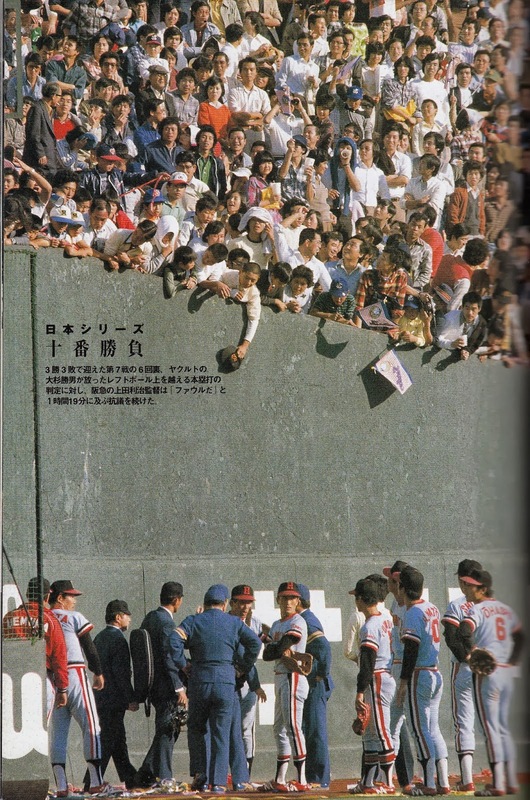 They won the Pacific League pennant in 1974, however NPB decided that the ballpark's capacity was too small for the Series and relocated the Orions' home games to Korakuen Stadium in Tokyo, home of the Giants and Fighters. (The Pacific League Playoff between the Orions and the Hankyu Braves was allowed to take place in the ballpark however.) Between reading about this and noting in this post the other day that the Swallows used Korakuen Stadium as their home ballpark in the 1978 Series instead of their normal home ballpark of Jinju Stadium, I got curious to see how often it has happened that the Nippon Series has moved a team to another ballpark. It turns out that it's happened a handful of times. - 1962 - the Toei Flyers beat the Hanshin Tigers four games to two (with one tie). 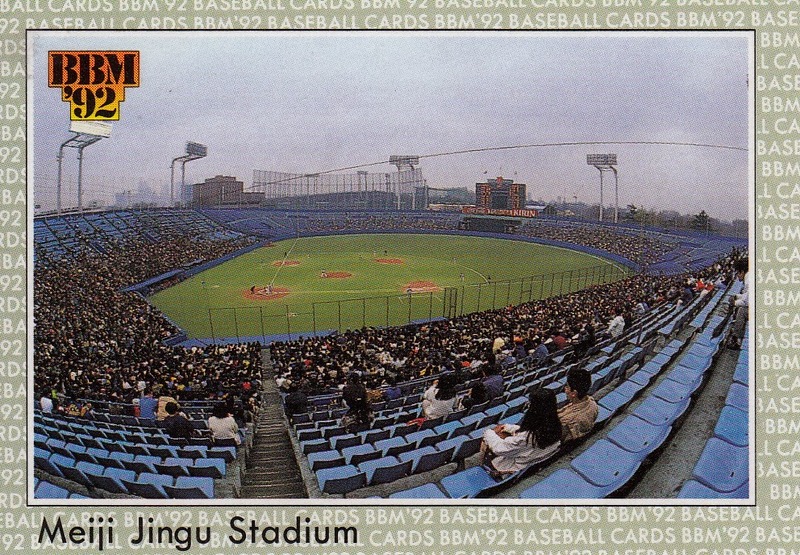 The Flyers played their home games at Meiji Jingu Stadium in 1962 and 1963 (I think they got displaced from the ballpark they were playing in in Setagaya ward in Tokyo by a stadium being built for the 1964 Olympics). 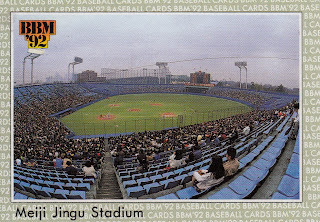 Games Three and Four of the Series were played in Jingu but Game Five was moved to Korakuen Stadium (where the Flyers would move in 1964 and remain until the ballpark was replaced in 1987). Bizarrely, it looks like the Game Five was moved due to a schedule conflict with college baseball being played at Jingu. - 1974 - the Lotte Orions beat the Chunichi Dragons four games to two. 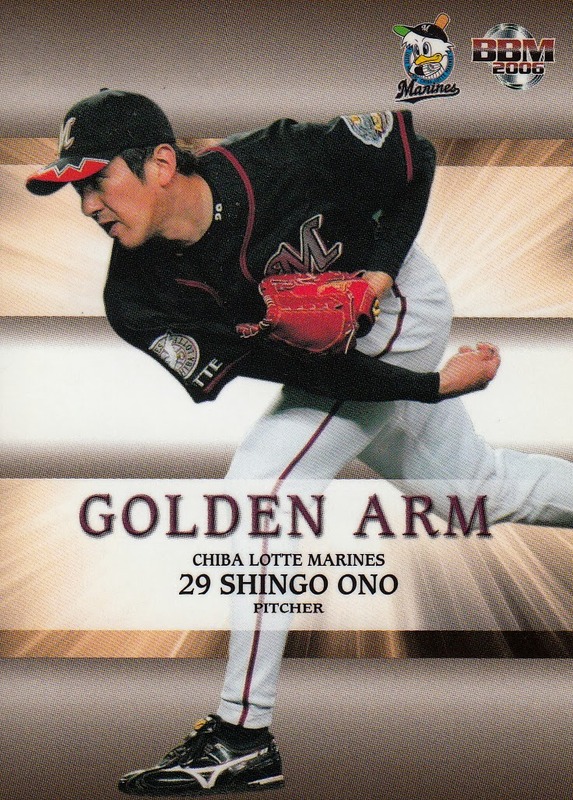 Lotte's home games in the Series (Games Three, Four and Five) were moved from Miyagi Baseball Stadium in Sendai to Korakuen Stadium in Tokyo due to the low seating capacity in Sendai. - 1978 - the Yakult Swallows beat the Hankyu Braves four games to three. Yakult's home games (Games One, Two, Six and Seven) were moved from Mejii Jingu Stadium to Korakuen Stadium due again to scheduling conflicts between the Series and college baseball games. 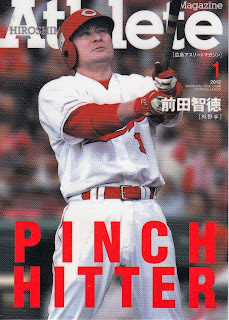 - 1979 - the Hiroshima Toyo Carp beat the Kintetsu Buffaloes four games to three. Kintetsu played their home games in Fujiidera Stadium in Osaka. Fujiidera did not have lights at the time and so was unable to host any night games for the Series. The Buffaloes home games in the Series (Games One, Two, Six and Seven) were moved to Osaka Stadium, home of the Nankai Hawks. 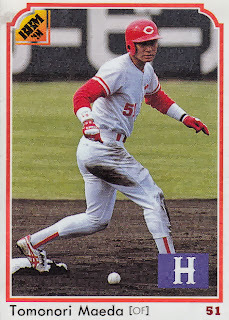 - 1980 - the Hiroshima Toyo Carp beat the Kintetsu Buffaloes four games to three (again). Once again, Kintetsu's home games (Games Three, Four and Five) were moved to Osaka Stadium. Lights were added to Fujiidera Stadium in 1984 so that the next time the Buffaloes lostmade the Series in 1989, they were able to play at their home park. There were two other Nippon Series that were played in ballparks other than the home parks of the two teams involved. 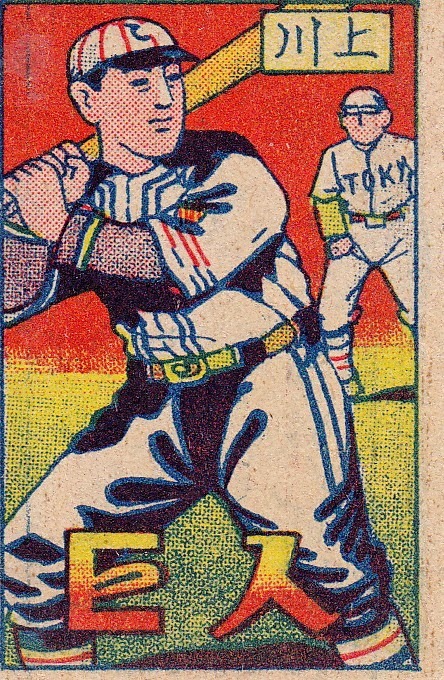 The first Nippon Series in 1950 was apparently played as a tour across Japan. 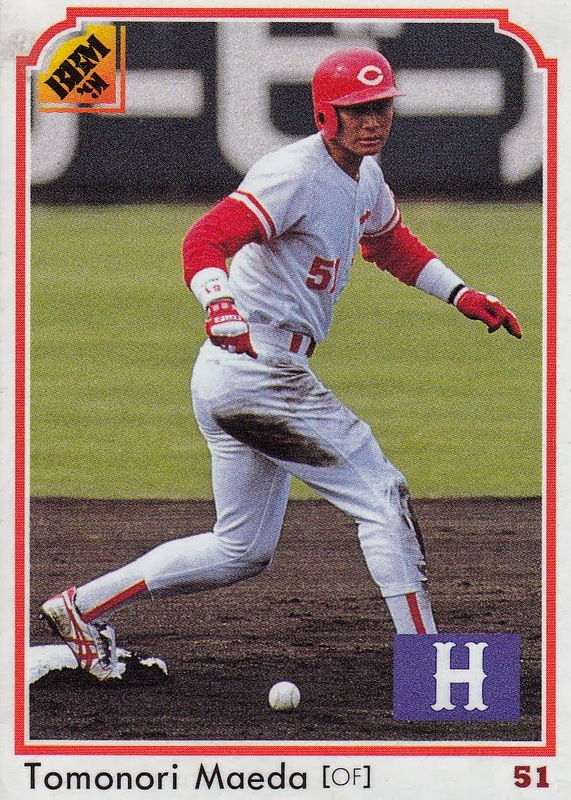 The six games between the Mainichi Orions and the Shochiku Robins (Orions won 4 games to 2) were played in Jingu, Korakuen, Koshien, Nishinomiya (home of the Hankyu Braves), Nagoya and Osaka Stadiums. The 1953 Series between the Giants and the Hawks had a very odd breakdown of games. Instead of the standard 2-3-2 pattern the schedule was quite different. 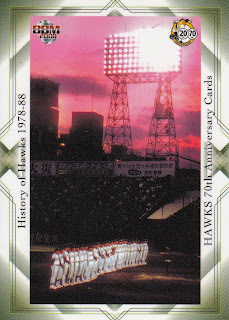 The first two games were played in Osaka (home of the Hawks), the next two were played in Korakuen. 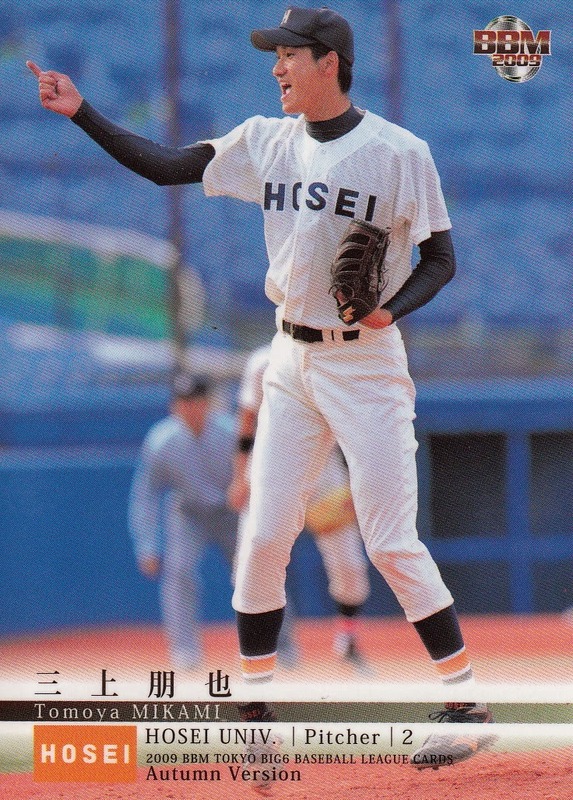 Game Five was played back in Osaka, Game Six was played in Koshien(!?) and Game Seven was played in Korakuen. I have no idea why this Series and only this Series has this weird schedule. I got some of the information for this from the Nippon Series page on Japanese Wikipedia, specifically a section on "Irregular Schedule". NPB held their draft today and as usual, Deanna and Gen each live blogged it - Deanna pulling an all-nighter to do so as the draft started at 1 AM California time. Deanna also did a photo-post previewing the players eligible for the draft. Gen has a list of picks broken down for each team in the Central and Pacific leagues. 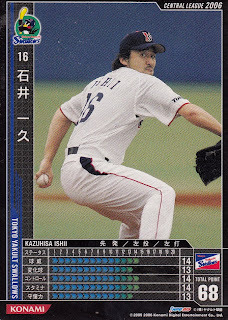 As usual there were a handful of guys from the Tokyo Big Six who got drafted. Here's my annual list of guys drafted today that already have baseball cards from BBM's Tokyo Big Six sets. All sets are from BBM. I'm only listing regular cards as I don't have a complete list of the insert cards. 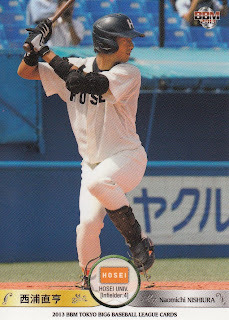 If it wasn't obvious from how I put it, Mikami is a former Hosei player who's been playing for JX-ENEOS in the industrial leagues the last year or so. I think I've missed some players like him in previous years but now that I have my cards in a real database I should be able to find these guys as well. 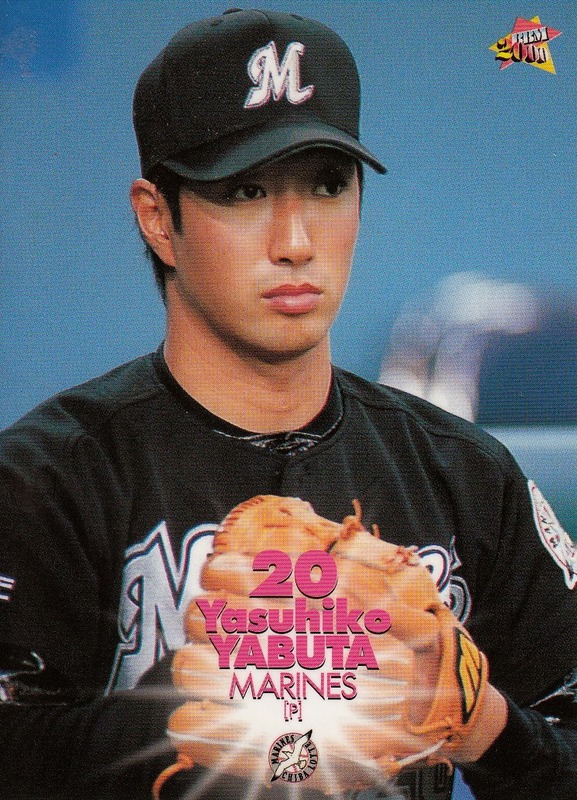 There's one last player who retired at the end of the season that I wanted to do a post about and that player is Yasuhiko Yabuta of the Chiba Lotte Marines. I did a post for Yabuta back in 2007 when he signed with the Royals so I won't be showing too many cards here. He was a second round draft pick of the Marines in the 1996 draft. 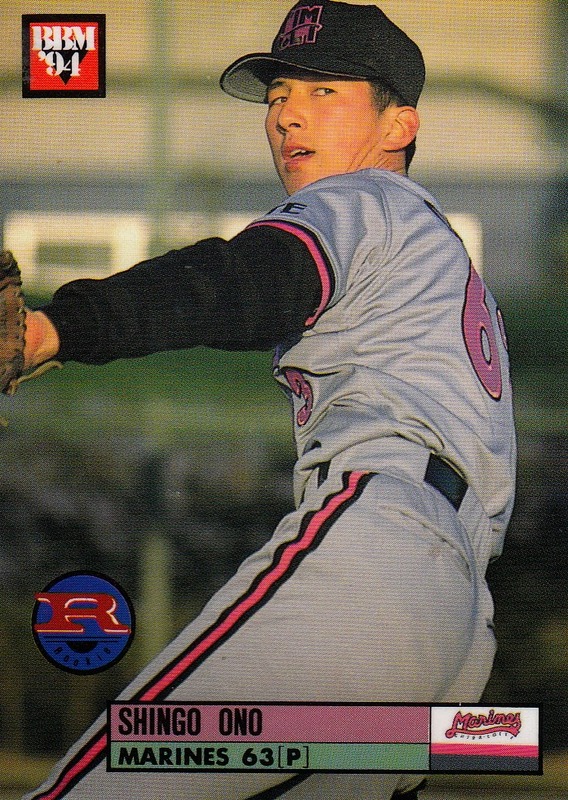 His rookie card was #501 from the 1996 BBM set. 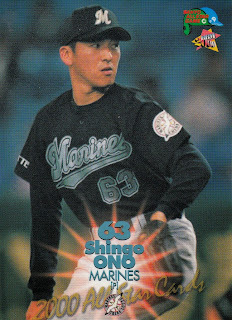 He also has a card in the Takara Marines set from 1996. 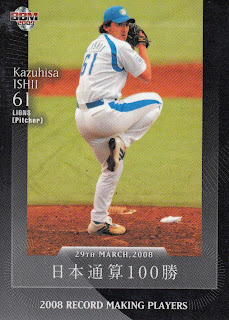 His first Calbee card was not until 2006 (#006). 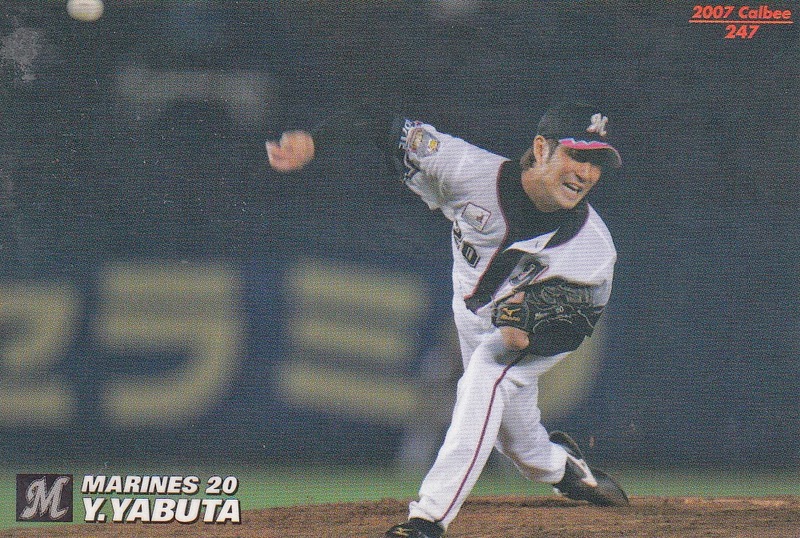 Yabuta spent much of the first eight years of his career as a starter (when he wasn't injured or in the minors). 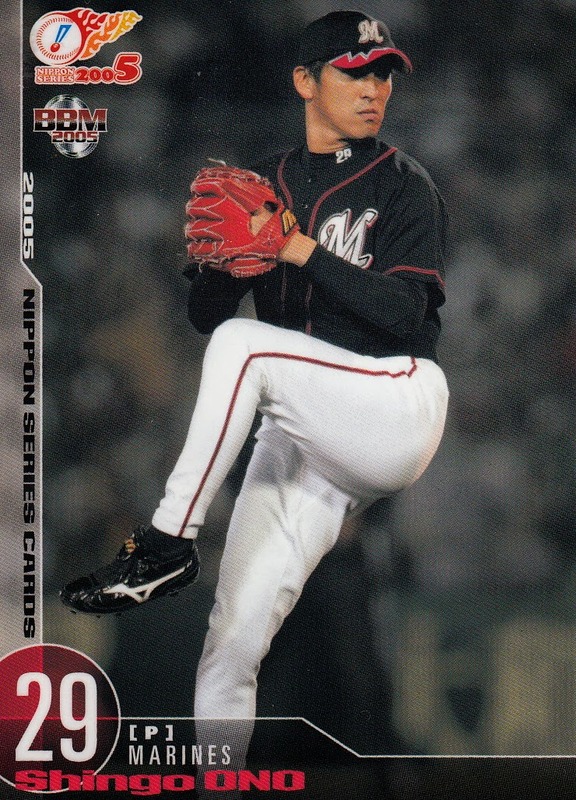 He switch to the bullpen pretty much full time in 2004 and had a lot more success that way. 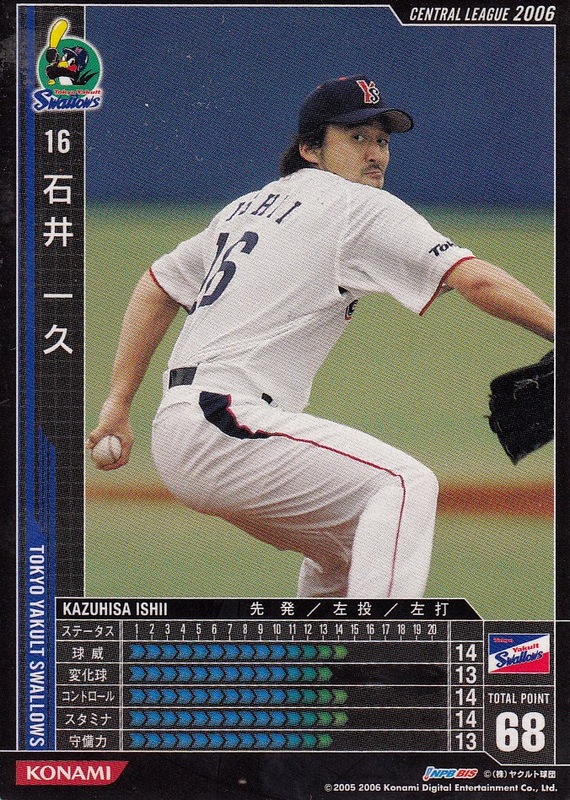 He appears to have mostly pitched in middle relief before he left for the US for the 2008 season. After two seasons with the Royals, he returned to the Marines. He was back in middle relief in 2010 but became Lotte's closer in 2011 and 2012. I'm not entirely sure what happened to him this year but he didn't make any appearances at the ichi-gun level. I suspect that he was injured all year. Yabuta made two All Star teams (in 2005 and 2007) and played in two Nippon Series (2005 & 2010). He only lead the league in a category that BBM cares about once, in 2007 (Hold Points). 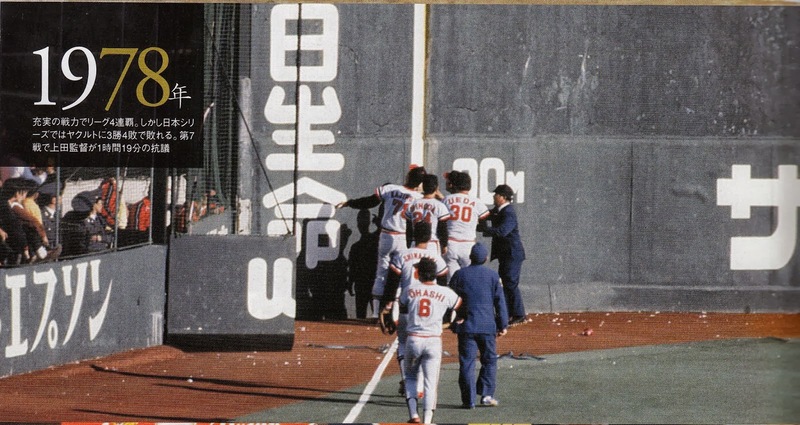 Today is the 35th anniversary of an interesting event in a Nippon Series game. 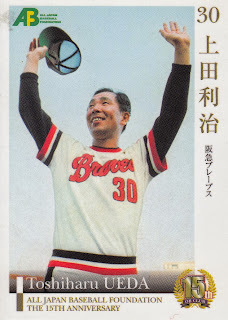 On October 22, 1978 the Hankyu Braves played the Yakult Swallows in Game Seven of the Nippon Series. 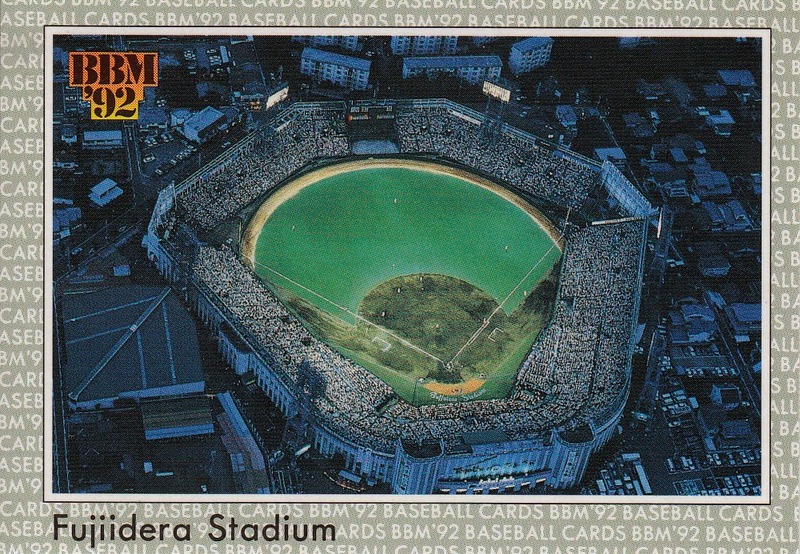 (Curiously it looks like the Swallows were playing their home games in the Series at Korakuen Stadium in Tokyo rather than their normal home stadium of Meiji Jingu Stadium, probably due to the higher capacity of Korakuen, home of the Giants.) 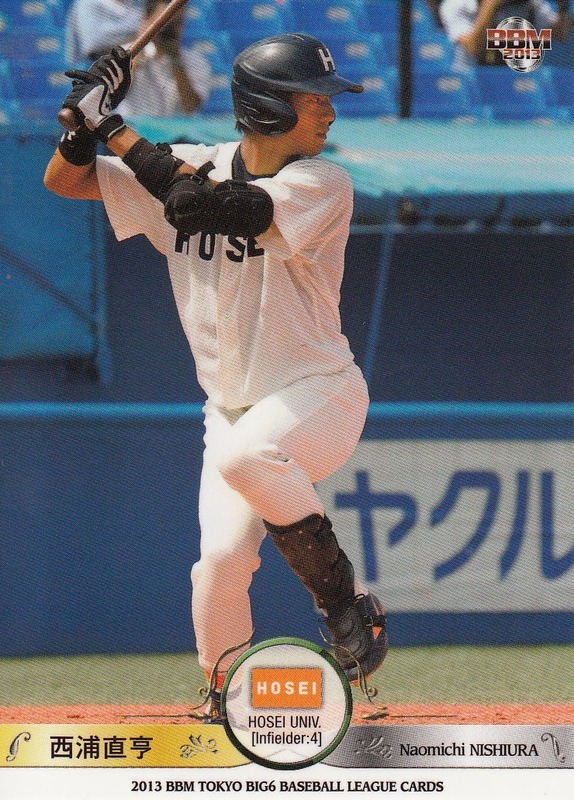 During the game, Katsuo Osugi of the Swallows hit what the umpires called a home run down the left line. Hankyu manager Toshiharu Ueda came out and argued that the ball was foul. And argued. And argued. 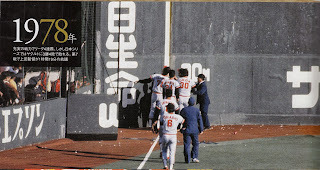 Ueda eventually pulled his team off the field as he continued to argue that the ball was foul. Finally, after an hour and nine minutes, the umpires appealed to the NPB commissioner who concurred with their call. 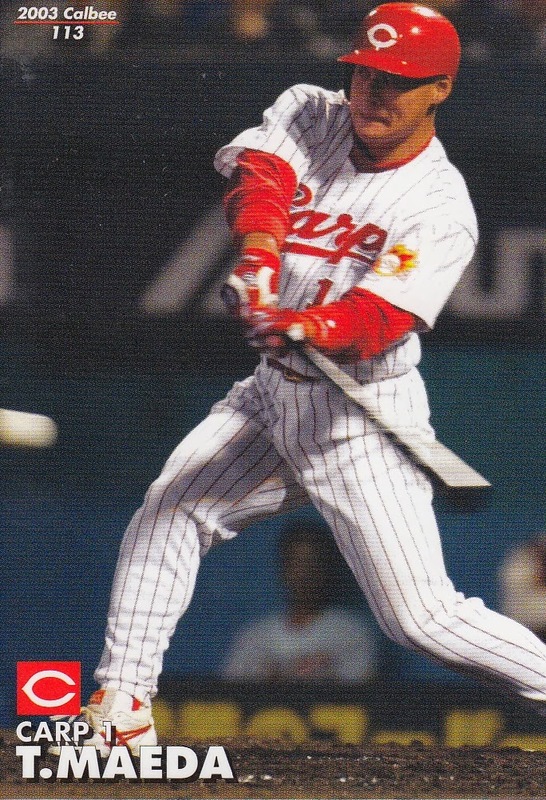 Osugi would hit another home run later in the game for good measure (he hit four in the Series, winning the MVP award) and Charlie Manuel contributed one as well as the Swallows won 4-0 to win their first ever Nippon Series. The Japanese Wikipedia entry on the 1978 Nippon Series appears to go into a lot of detail on why Ueda felt the ball was foul although the Google translation is a little confusing. I looked around a little on YouTube but I couldn't find any video of the home run. I do have a couple pictures from the argument from a couple of books. This first picture is from the 1999 NPB publication "The Legend Of 50 Years" celebrating the first 50 years of the two league system. 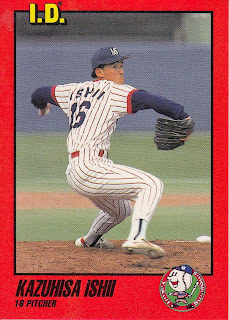 UPDATE - found an interview with Ueda from 1989 or 1990 (when he was still managing the Braves only now they were the Orix Braves) where he talks about this game. There's a couple clips from the game itself but nothing that's definitive at all. It looks like Osugi didn't know if it was fair or foul either. With the Eagles defeating the Marines today I no longer have an excuse to not do posts on the last two retirement players (not that either was playing for the Marines in the playoffs). I'll do Ono tonight and try to get to Yabuta tomorrow. 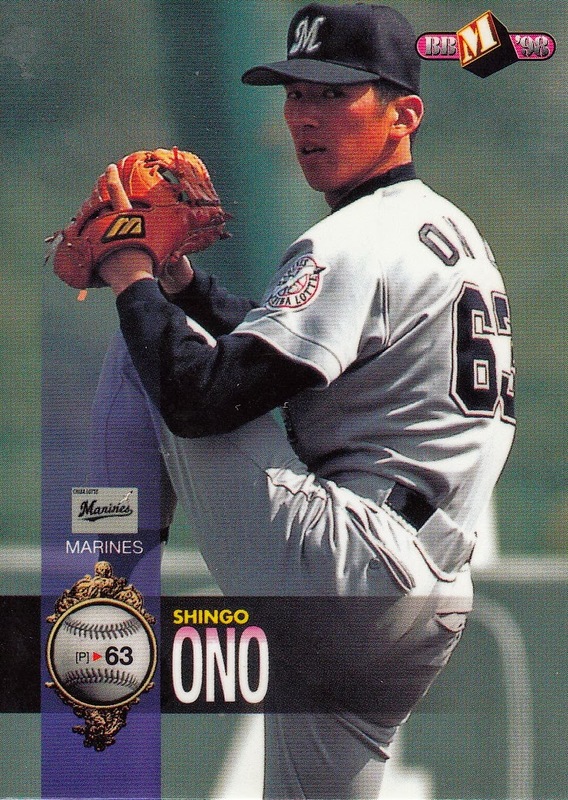 Shingo Ono was a sixth round pick of the Marines back in the 1994 draft (and I always I feel compelled to mention that this draft was held in the fall of 1993). 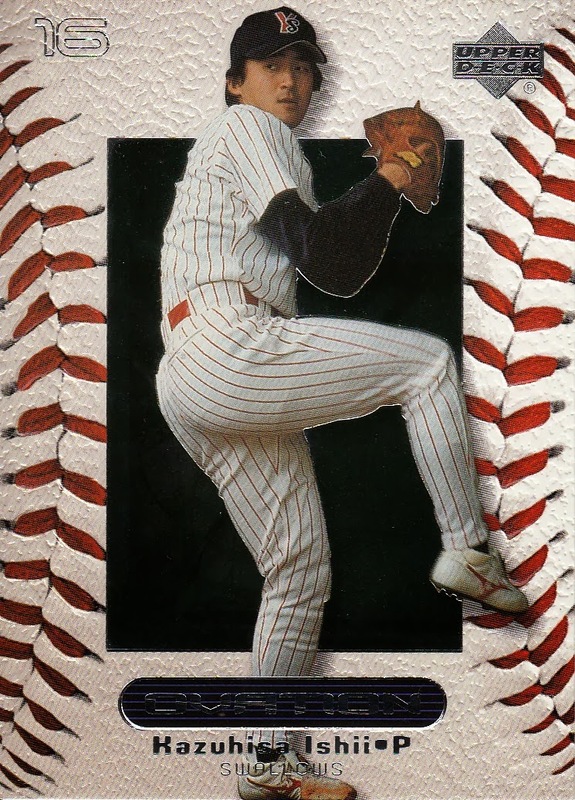 His rookie card was from the 1994 BBM set (#528). 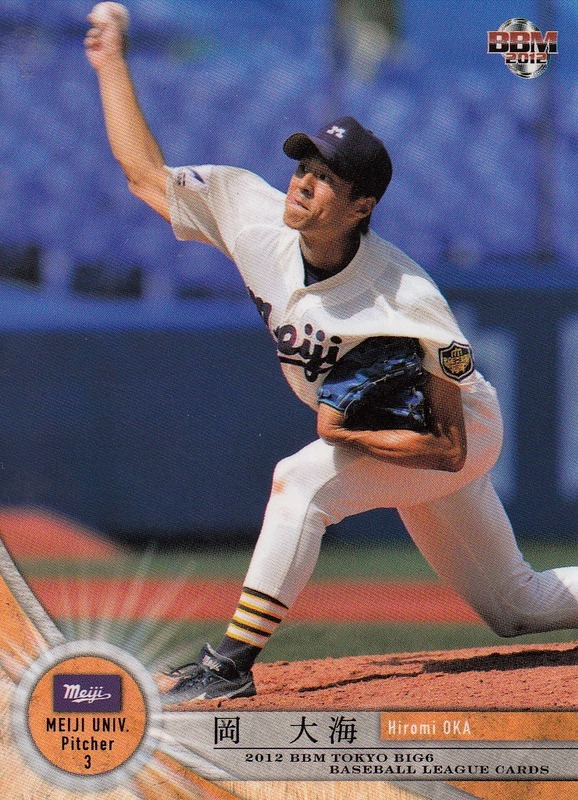 He did not have a Calbee card until his breakout season of 2000 (#157). Ono spent most of his first five seasons with the Marines pitching in the minors. He had two appearances at the ichi-gun level in 1997 and 1998. 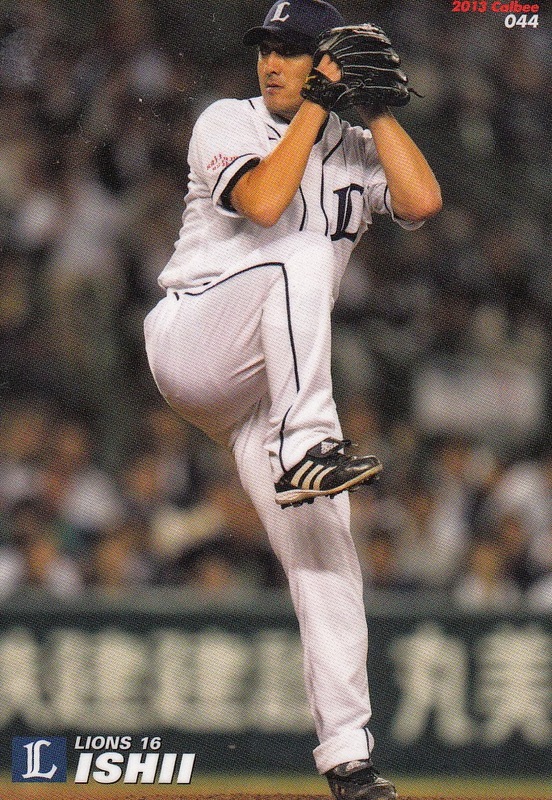 He make it into 10 games in 1999 and moved into the rotation as a regular starter in 2000. 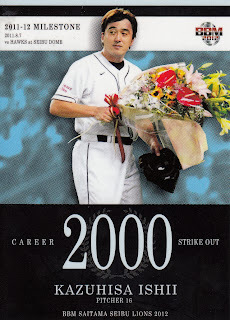 As I mentioned before, 2000 was a breakout season for him as he went 13-5. He remained in the rotation for much of the following 12 seasons (although there were a few that he mostly worked out of the bullpen). 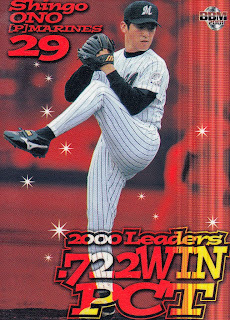 The only season that he approached the win-loss record he had in 2000 was 2005 when he went 10-4. He spent all of 2013 playing for the Marines ni-gun team and decided to retire partly because he had not been able to return to the top team. Not to keep harping on it, but 2000 was far and away his best season. It was the only year that he made the All Star team and it was the only year that he lead the league in any category that BBM commemorates (Winning Percentage). 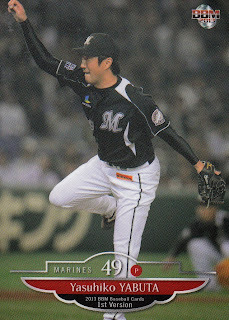 He played in two Nippon Series for the Marines - 2005 and 2010, both won by the Marines. 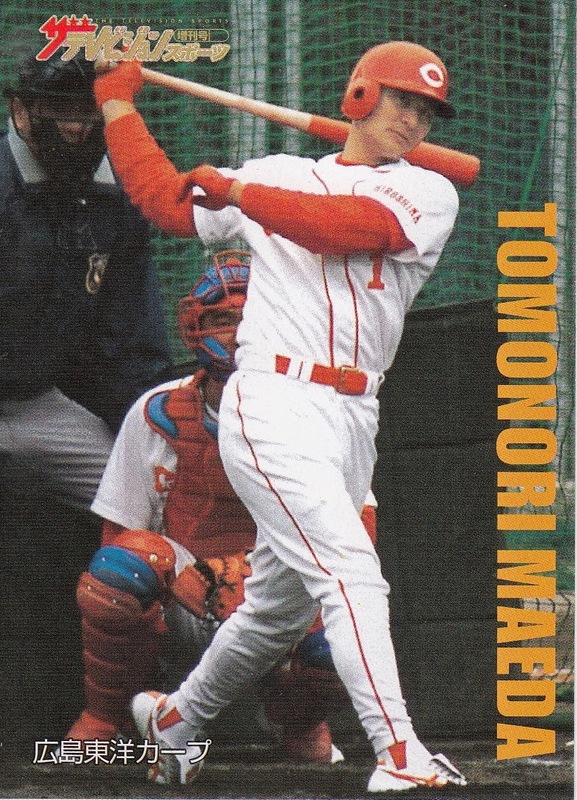 Yet another player who has retired as of the end of the season is Tomonori Maeda, longtime Hiroshima Toyo Carp. 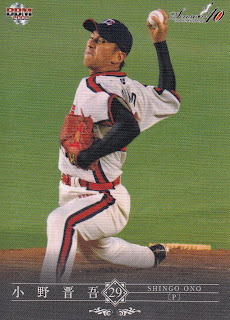 Maeda was drafted by the Carp in the fourth round of the 1990 draft (held in the fall of 1989). He made his debut with the ichi-gun Carp in the 1990 season and has played for no one else during his entire 24 year career (well, 23 years according to Baseball Reference as he missed the entire 2009 season). 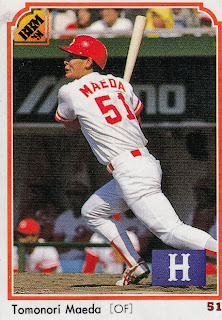 Maeda's rookie card is from the debut BBM issue in 1991 (#14). He is one of only four players who have appeared in at least one of BBM's flagship's sets each year since 1991 - he, Takeshi Yamasaki and Masa Yamamoto have been in either a 1st or 2nd Version set from 2002-2013 as well as the regular set from 1991-2001. 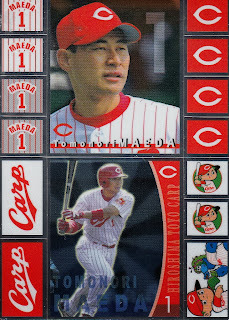 Motonobu Tanishige has been in every regular set from 1991-2001 as well as each 1st and 2nd Version set from 2002-2013. His first Calbee card was #99 in the 1992 set. 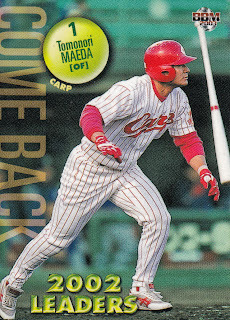 Except for time missed with injury, Maeda was one of the starting outfielders for the Carp from 1991 to 2008. He hit over .300 several times and hit more than 30 home runs once, in 2005. He ended up with a career batting average of .302 with 295 home runs. After coming back from injury in 2010, Maeda was a full time pinch hitter/DH for interleague games. 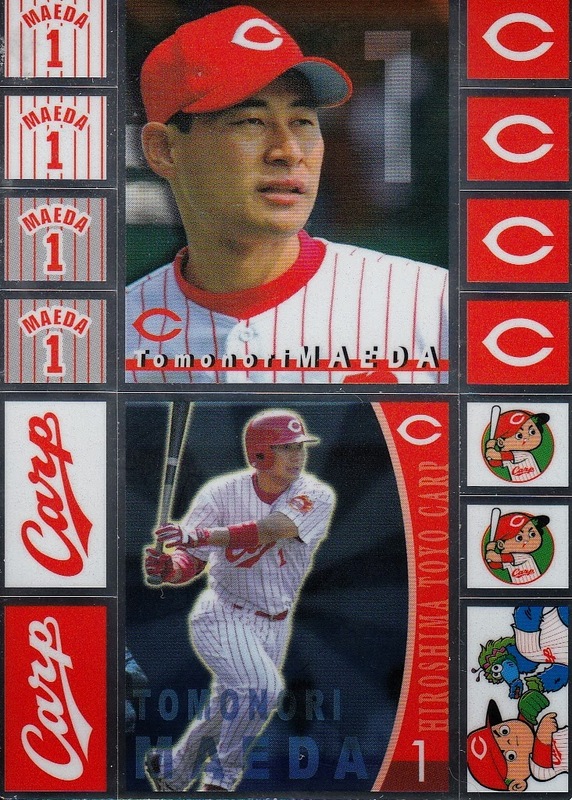 Maeda never led the league in any category that BBM does Leader subset cards for. 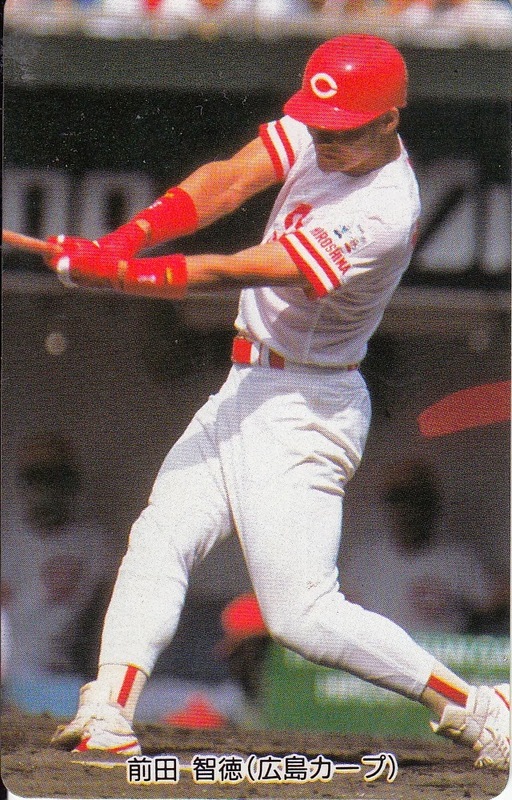 He did lead the Central League in doubles twice (1993, 1998) and total bases once (1993). He also won the Comeback Award in 2002 (which gave him his sole Leader subset card in 2003). He reached 2000 hits on September 1, 2007. He made the All Star team 7 times - 1993, 1994, 1996, 1998, 2005, 2007 and 2008. The Carp only made the Nippon Series once during his career in 1991 (and unfortunately won't be returning this year), losing to the Seibu Lions in seven games. The Red Sox wrapped up the American League pennant last night by defeating the Tigers 5-2 in Game Six of the ALCS (and 4 games to 2 for the series). Koji Uehara closed the game out for the Sox for his third save of the Series. He also was the winning pitcher in Game Two, so he either won or saved all four of the Red Sox victories. 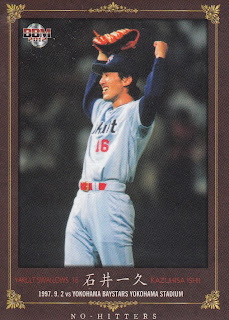 He was named the MVP of the ALCS, the first Japanese player ever so honored. 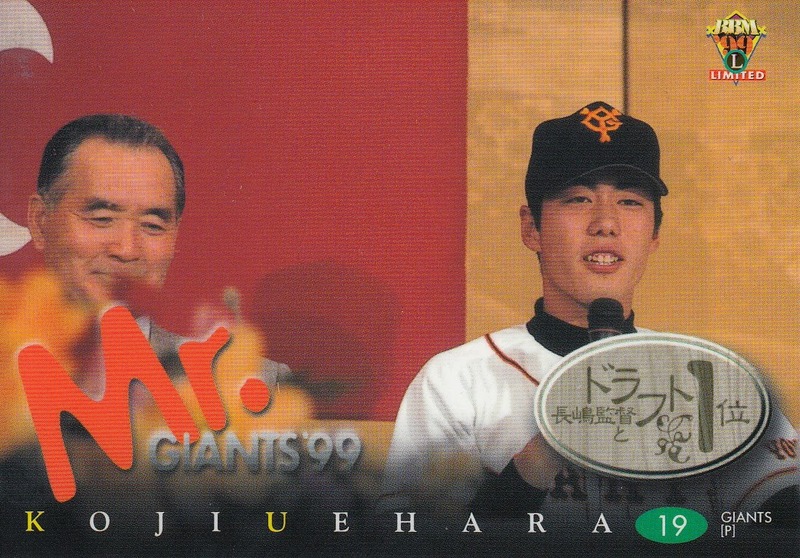 Here's Uehara's card from the 1999 BBM Mr. Giants set. 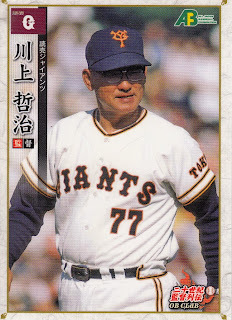 This set was a biographical set for Shigeo Nagashima (aka Mr. Giants). 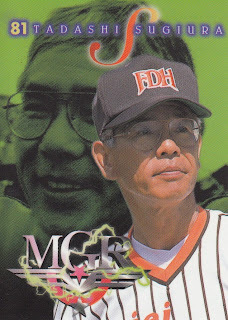 One of the subsets in the set features Giants players who were taken number one in the draft while Nagashima was manager. 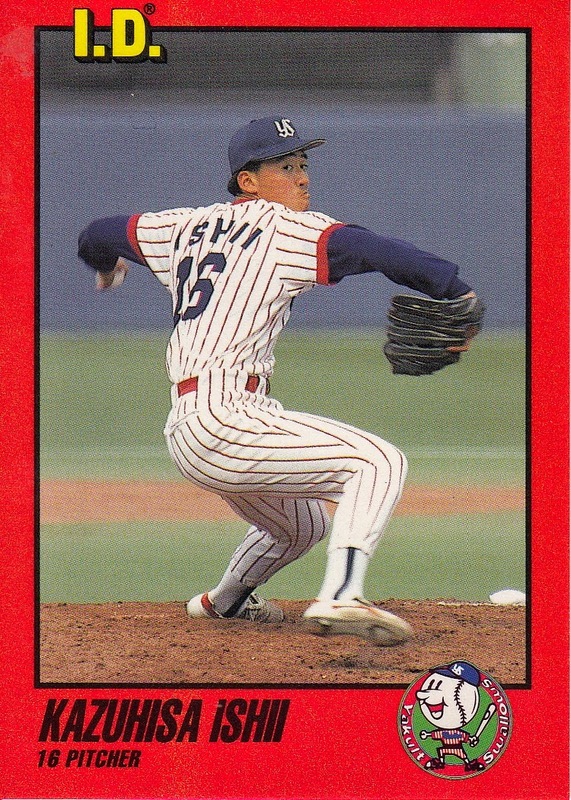 This is Uehara's card (#G95) from that subset. I'd been holding off on post for a couple of players who had retired at the end of the season while their teams were still playing in the post-season but I've realized now that the remaining players aren't on the roster for their teams anyway so it doesn't matter that much. It matters even less for Kazuhisa Ishii as his team got eliminated today. 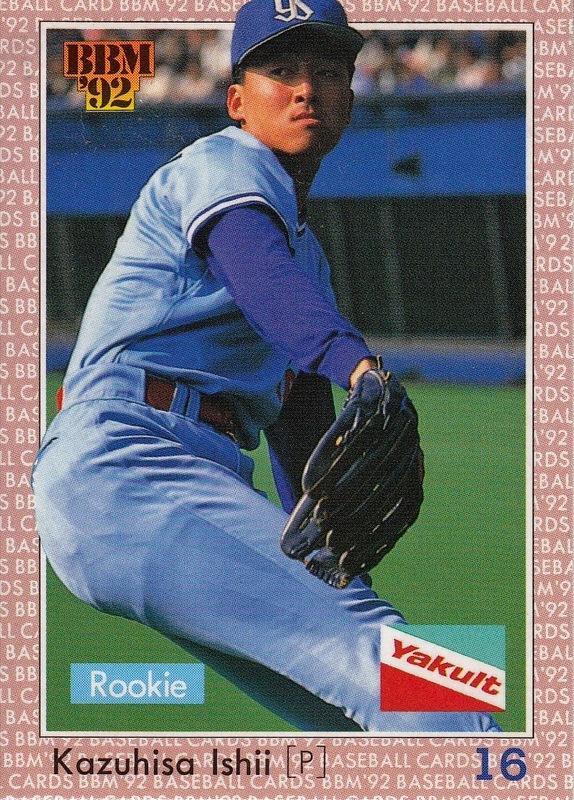 Ishii was a first round pick of the Yakult Swallows in the 1992 draft out of high school. His rookie card was #464 from the 1992 BBM set. 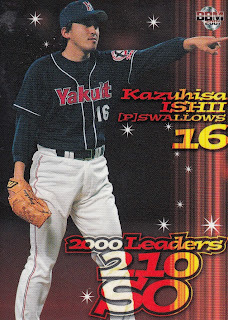 He also had a card in that year's Takara Swallows set. 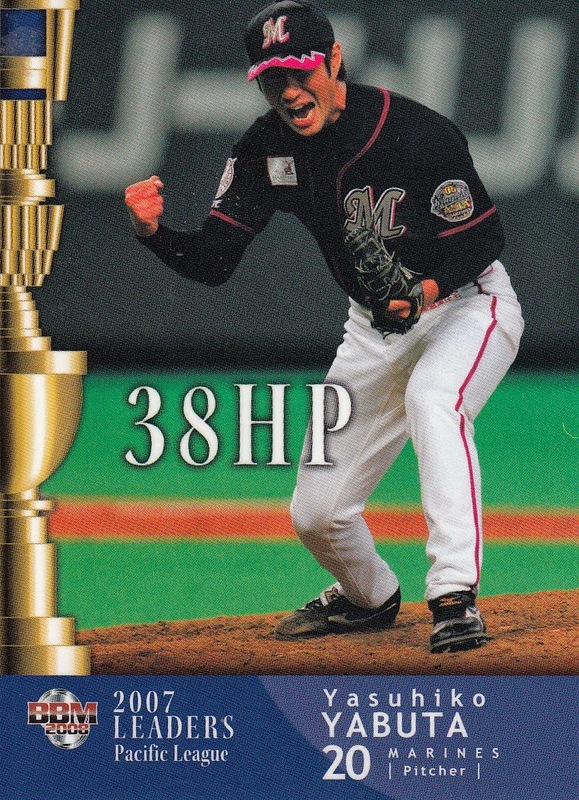 His first Calbee card didn't come until 1998 (#039). 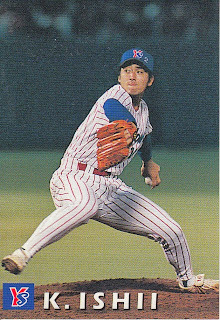 Ishii spent 10 eventful years in his initial stint with the Swallows. He had some control issues as well as some injury issues before he left for the majors via the posting system following the 2001 season. 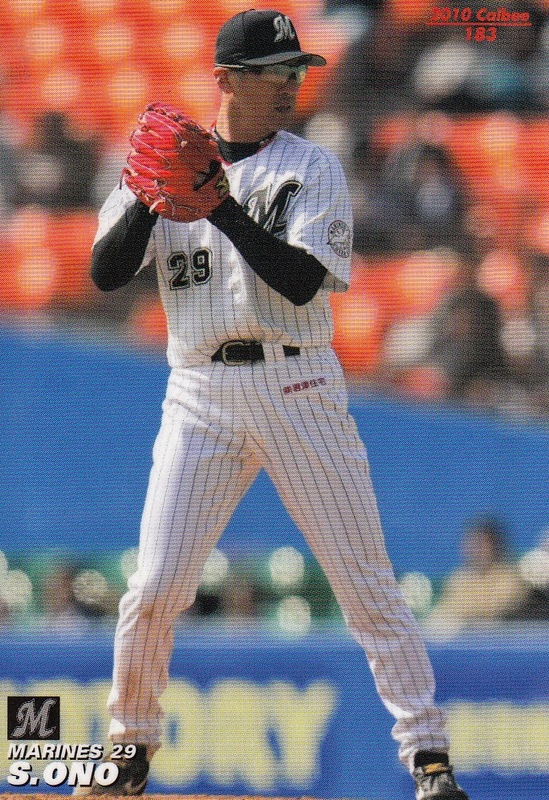 Following four seasons in the US with the Dodgers and the Mets, Ishii returned to Japan in 2006. 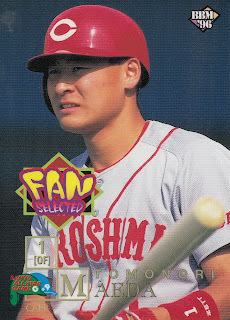 Ishii's manager for most of the 1990's, Katusya Nomura, had taken over the Tohoku Rakuten Golden Eagles and attempted to woo Ishii to Sendai. 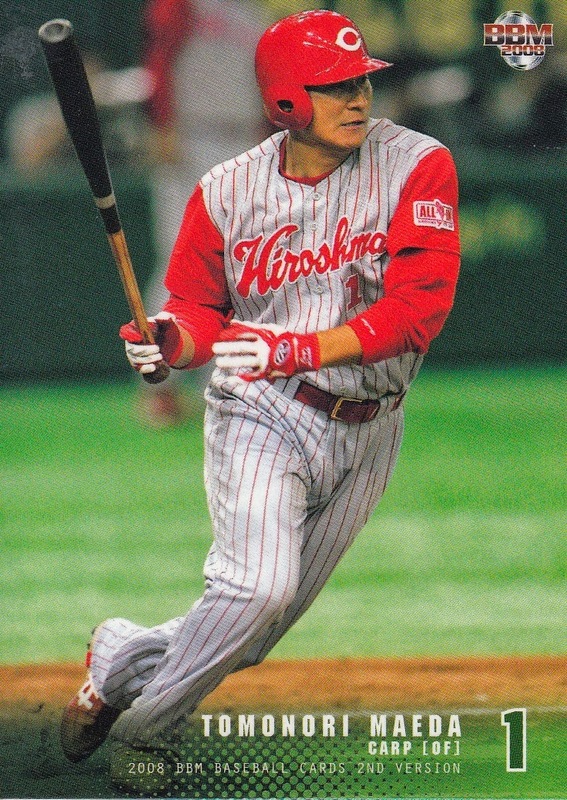 Ultimately Ishii decided to return to Yakult where his former battery mate, Atsuya Furuta, had become player-manager. Ishii only remained with the Swallows for two more seasons. 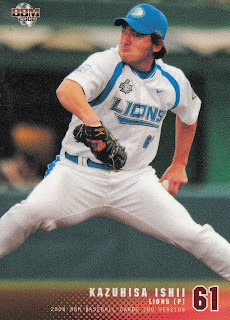 I'm not positive, but I think he left the Swallows as a free agent (rather than got released) and signed on with the Lions where he has spent the remainder of his career. Ishii had an interesting career. He ended up with 2115 strikeouts, good enough for 14th overall, along with a record of 143-103. 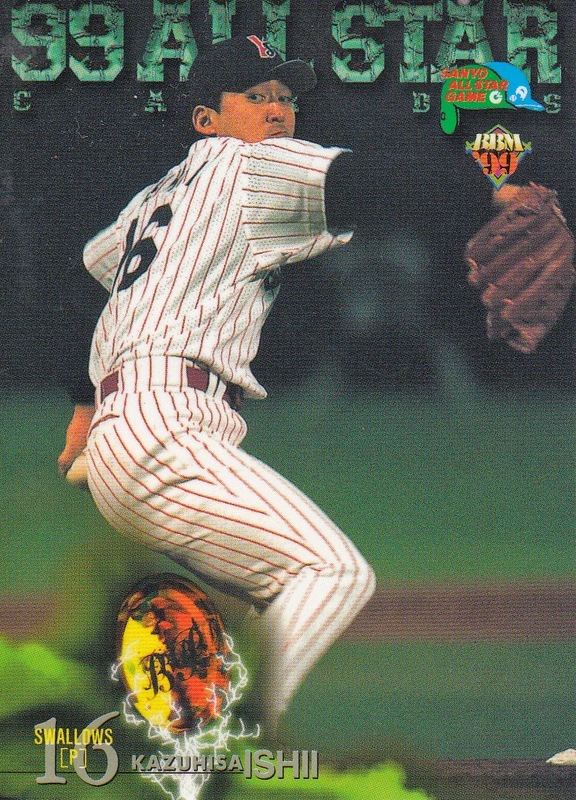 He lead the league in strikeouts twice (1998 & 2000) and ERA once (2000). He threw a no-hitter against the Baystars in 1997. 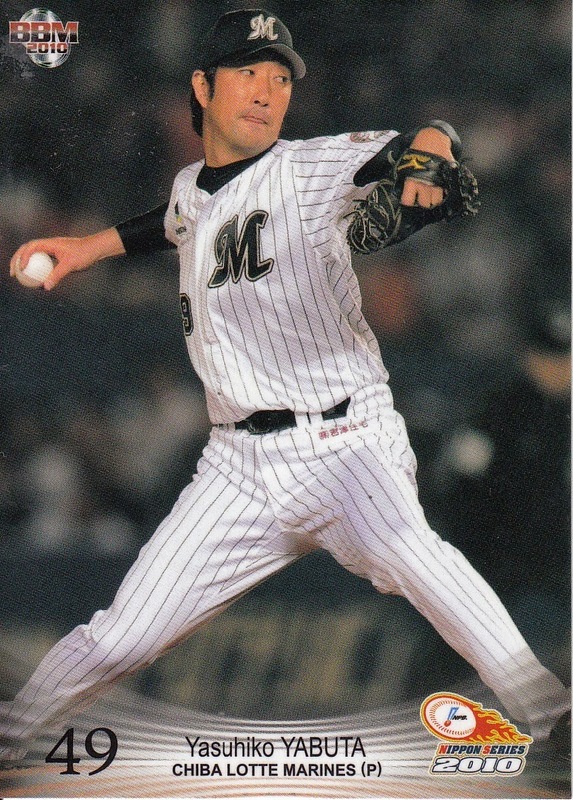 Surprisingly, Ishii only made one All Star team in his 18 years in NPB - in 1999. 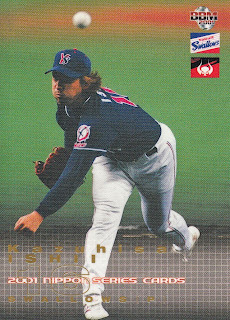 It's easy to forget now, but the Swallows of the 1990's were a powerhouse team, appearing in five Nippon Series between 1992 and 2001 and winning four of them. 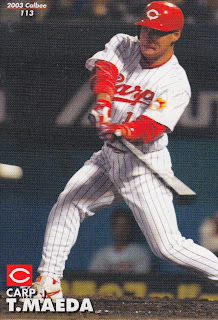 Ishii appeared in all five Series, winning "Outstanding Player" Awards in the 1997 and 2001 Classics (assuming they call the Nippon Series the "Fall Classic" in Japan). He also appeared in the 2008 Nippon Series with the Lions.